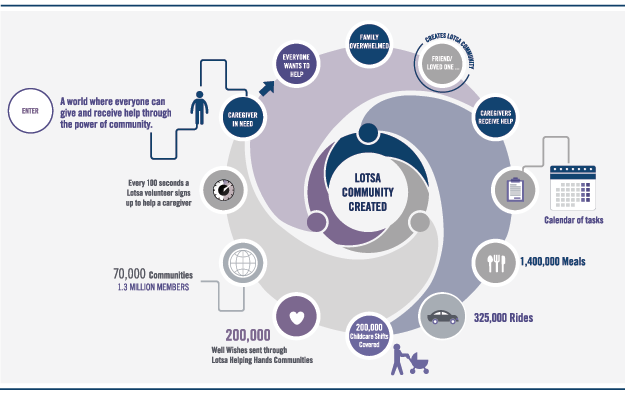 When people rally to help someone in their family or Community, Lotsa Helping Hands makes it easy for each person to know what to do and when. 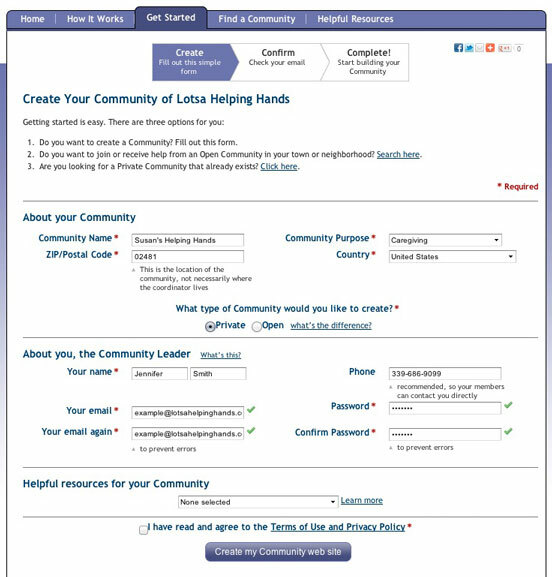 Learn more about using Lotsa Helping Hands by reading about our features, member roles, and tips for getting started. Help Calendar: Our easy to use Help Calendar enables members to schedule and sign up for tasks that provide caregiver support including meals for the family, rides to medical appointments, and visits. Coordinators can post tasks that require help so volunteers can easily see what’s needed. Regular reminders are sent to volunteers so that no one forgets their commitments. Community Building Features: We understand that members spend a lot of time in their Lotsa Communities so we’ve made our Community web sites easy to use and even easier to customize. Members can communicate with one another through message boards, post personal blogs, share photos, and send well wishes to the family. Custom Sections: A powerful and efficient tool for caregivers, Custom Sections add a little something extra to your Community. Add a ‘Donate’ tab and section or special recipes or a personal blog. Photo Gallery: Your Photo Gallery in your Lotsa Community is the perfect place to share invaluable snapshots along your caregiving journey. Post or view personal photos in your Community and share a memory or milestone. Message Boards: The Message Board is the best place to connect and keep up with members of your Community. Both Members and Coordinators can post anything they wish to share, ask how to help the community, comment on a post and start a conversation. Well Wishes: The soul of your caring Community, Well Wishes is the place to drop a line to say hello, post a prayer or let the family you are helping know that you’re thinking about them. 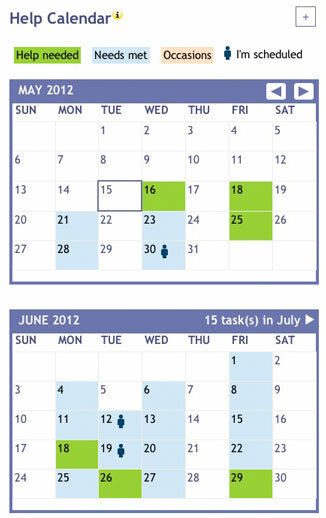 Occasions (Previously Events): Need to keep track of important dates or milestones? Add Occasions to your calendar to remind everyone of the important dates that you simply don’t want to forget such as birthdays, anniversaries and more. Events: Organize items in your Help Calendar into Events. Easily coordinate events that require multiple volunteers or that span many days, such as a Fundraiser or a clean-up day. Organizing, scheduling and volunteering has never been easier! 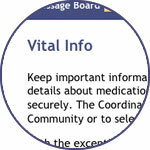 Vital Information Feature: Keep important information in one place. Use the Vital Information section to store details about medications, doctors, allergies, insurance, and anything else safely and securely. The Coordinator can make this information available to the entire community or to select members, such as the immediate family. Groups and Permissions: For easier organization and enhanced privacy, put select members into one group and adjust their privacy and permissions. Grant immediate family members permission to accept members or to create new custom sections in your Community. Or allow neighbors the ability to schedule activities on the Help Calendar. Stay organized in your Community by sharing the right stuff with the right people. The Community Leader is initially the person who first created the Community web site. Community Leaders have full access to everything in their Community and can appoint Coordinators to help. Once the Community is created, the Community Leader can assign someone else the role of Community Leader and assume a Coordinator or a Member role. Coordinators are those Community Members who are granted various permissions to help organize the Community web site. 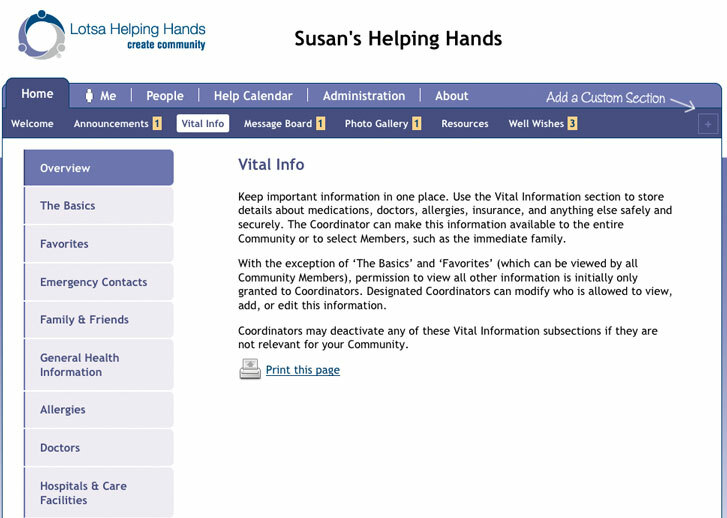 These include inviting Members to join, adding activities to the Help Calendar, and customizing the Community web site. Depending on the permissions granted to them, Coordinators can edit almost every part of the site to fit the exact needs of the Community. A Member is anyone who participates in the Community web site. Members may be family members receiving help, volunteers providing support, or anyone else just interested in following updates. Members each have their own secure login information, through their email address and password. Anyone can create a Community web site. The person who first creates a Community is referred to as the Community Leader. This person may be the patient, caregiver or a close friend or family member. Once the Community is first created (in about 60 seconds), the Community Leader may designate other Coordinators to help manage the various requirements of the Community. In fact, most Communities have more than one Coordinator. Sometimes someone is designated to enter tasks related to meal delivery, while another might be in charge of organizing childcare. Very often, the caregiver and patient are also designated as Coordinators in the Community so that they can easily see who is signing up for what task and so they can post their own messages in the Community. Can you have more than one Coordinator? You can change any Member to a Coordinator and create as many Coordinators as you like. It’s great to have more than one Coordinator to help manage the different aspects of your Community. You can be in more than one Community: there is no limit to the number of Communities in which you can participate or manage. Because you use the same password and email address, it’s easy to switch from one Community to any other Community where you are a Member. Additionally, you can participate in as many Private Communities as you like. In minutes, you, a friend, or a family member can fill out the form on this page. 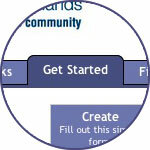 Simply enter the name of the Community being created and your name and email address. Who should create the Community? Go to the ‘Administration’ tab in your Community and begin posting volunteer or caregiver support needs with our easy-to-use templates. For instance, this might include dinner on Monday, Wednesday and Friday nights or rides to medical appointments on Tuesday mornings. When a new need is posted, everyone in your Community will get an email. The system also sends reminders to volunteers with the time, date and activity of their commitments. Next, enter the names and email addresses of those you wish to be part of your Community. Start with people who have expressed interest in helping. You can add more people anytime. No one can join your Community unless they are specifically invited by you. Those whose names you entered will receive a welcome message that will explain the service and give them all the information they need to easily join in and get started. As you like, you can add more to your Community — post photos, create custom sections, add resources from our nonprofit partners and more. Community Members can join in by posting well wishes, sharing announcements and sending messages to the family. Learn how to create a Community of support: the first steps in setting up the Help Calendar and inviting Members to your Lotsa Helping Hands Community.